Okay, so round-up of the recently finished projects. I actually finished my Ginny’s Cardigan a couple of weeks ago and have been wearing it, but I finally got around to adding the buttons. I chose an assortment of vintage glass buttons I bought at a local button-only store. They have that sort of magical feeling that one might expect from a Harry Potter-inspired knit with an owl-motif on the back. 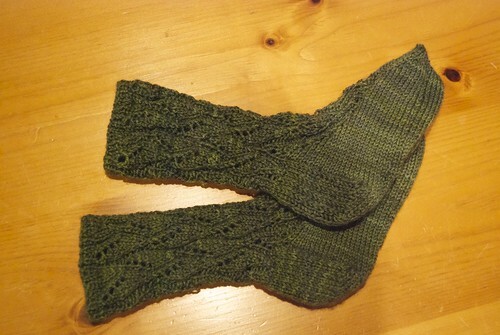 Next up, a pair of socks, also finished some time ago. I started these in November when I was in San Francisco and I used the instructions I got in Kate Atherley‘s custom sock class. I wasn’t thrilled with the yarn – the colours “pooled” a bit on the leg. But I was really happy with the fit! And last, but definitely not least, I whipped up this project in about a week, and even improvised my own pattern for it! 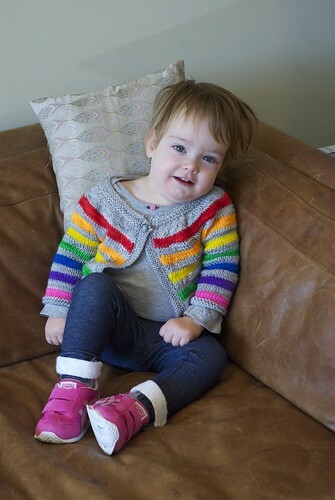 I wanted to showcase my Rain City knits rainbow pack that I bought a few months ago. I hope the full-length-now, three-quarter-length-later sleeves means the twins will get some longer-term use out of this. And just for fun, both the twins in Rain City knits sweaters. 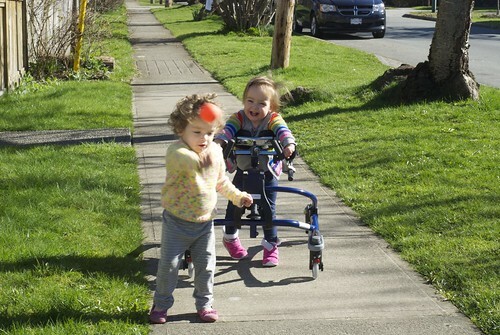 Don’t hate me, but we had a crazy (for March) sunny day yesterday. It’s cool and grey again today if that makes you East Coasters feel better. You’d think that when I had time to knit, I’d work on any number of works in progress – B’s sweater that has been languishing since September, or my never ending blanket. But no, instead I cast on something new. That colour combination looked good in my mind but sort of garish in reality. So I frogged it. Then I knit four inches of a new sock and realized it was too wide and the gauge too loose. 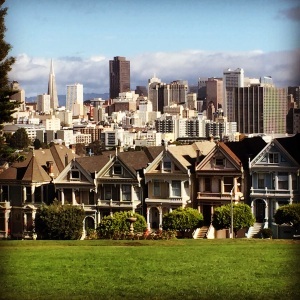 Perhaps I need new needles – some yarn tourism is in order. 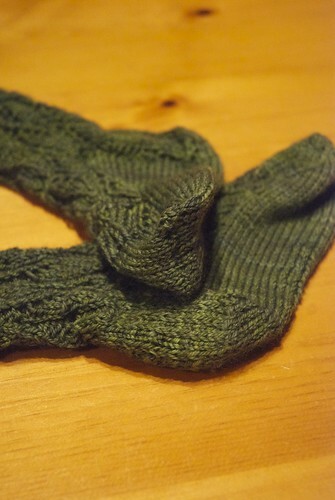 There’s something very satisfying about making socks, even though they take quite a while. You work work work on the cuff, and then the heel goes in a snap, and suddenly you’re at the foot and the toe and they’re done! There’s quite a bit of technique – picking up stitches, turning, and making that satisfying heel. This pattern is Almondine, and is from a book I grabbed called Sock Master Class. There’s even a DVD in the book, though I haven’t watched it yet. You wouldn’t believe how many books there are devoted to socks out there. These were cuff-down, so the principles were mostly the same as the Churchmouse Socks I made earlier. I never did memorize the lace pattern although the book claims it’s simple and easily memorized – probably haven’t knitted enough to “understand” the pattern. That meant lugging the book around when I knit. I also made them on size 4 needles because I was travelling and only had 4s. I should have made them on smaller ones, but the gauge actually wasn’t far off. Still, they may have looked neater on 2s. 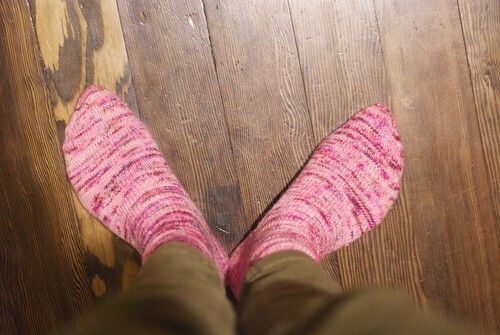 I made them from Sweet Georgia Sock Yarn in “Botanical” Colourway and I liked the yarn a lot. 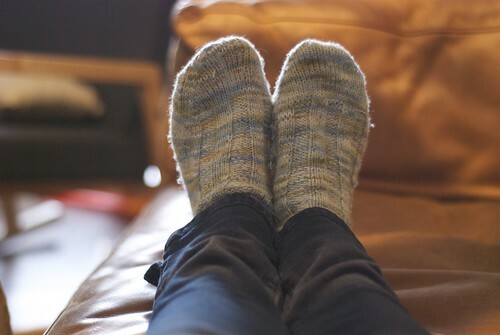 I intended to make them for myself but then my mother hinted she would love a pair of woolly socks, so I plan to give them to her. I noticed recently on a weekend away that she still does that whole bathrobe and fuzzy sock thing in the morning, so I know she will wear them… unlike my dear husband, whose knit socks haven’t seen the light of day in weeks. To be fair it is summer, but it gets pretty cool at night. Ah well the pleasure is in making them. Summer heat continues and I keep on knitting with wool. 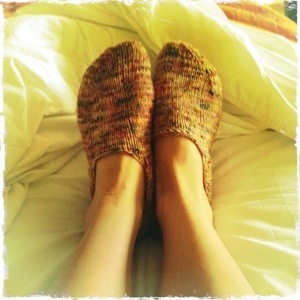 These Churchmouse “bed socks” are a project I started a few weeks ago in June. In the interim I made some stuffed animals and those were really good practice. So I came back to these finding my technique and standards had both improved and these seemed very flawed. But since they are for strictly at home use I decided to finish them off and chalk it all up to a learning experience. My kitchener stitch, used for closing the toe, still needs work though! I found an awesome diagram in a book called Socks Master Class so I plan to practice it before I finish my next pair. I’ve been really into knitting these days. I know it’s a little weird – who takes up knitting as you approach summer? But I can make significant progress on my bus ride home. 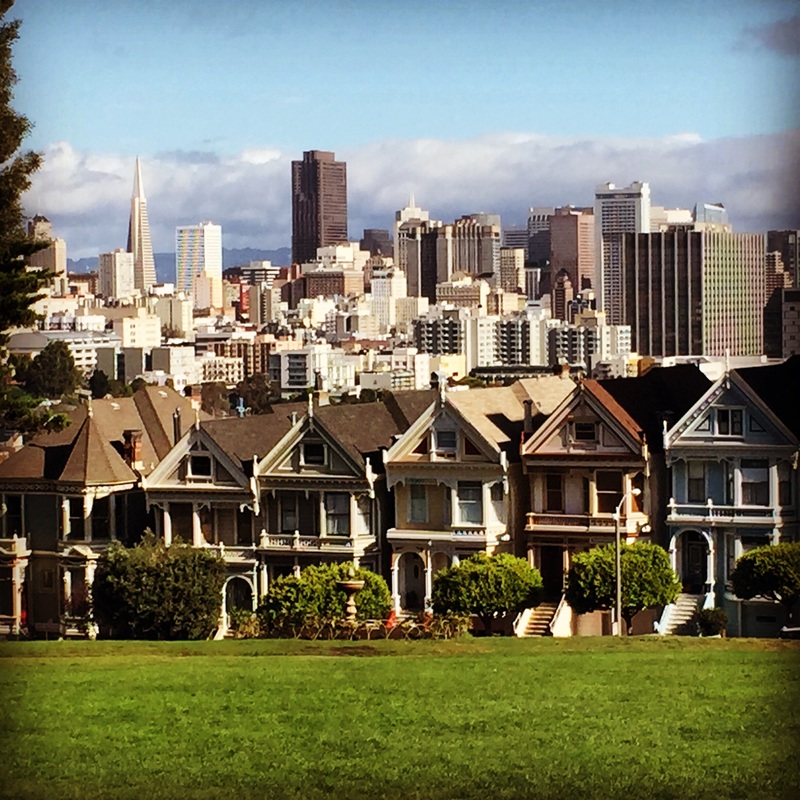 It’s social too – no whir of the machine growing out conversation. Lately, I’ve even been knitting while I sing my kids lullabies… of course when I drop a stitch I start to hum, and P has to remind me of the words. Sewing can, of course, be social too, but there’s something about just knitting for 5 minutes here and there that makes it very appealing. I have knit before, but I’ve knit more in the last month than I have in years. Knitting has changed a bit, with the availability of gourmet yarn, and the fact that everyone is knitting on circulars now. 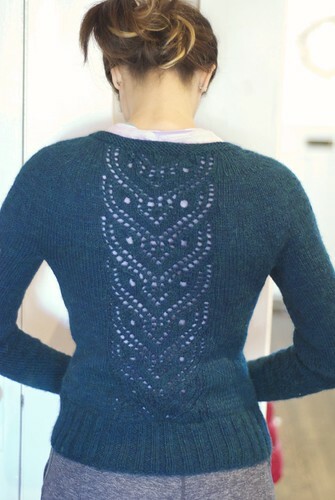 Sewaholic features some beautiful knitted garments on her site, which were inspiring too, and she has a great post on how knitting can improve your sewing. 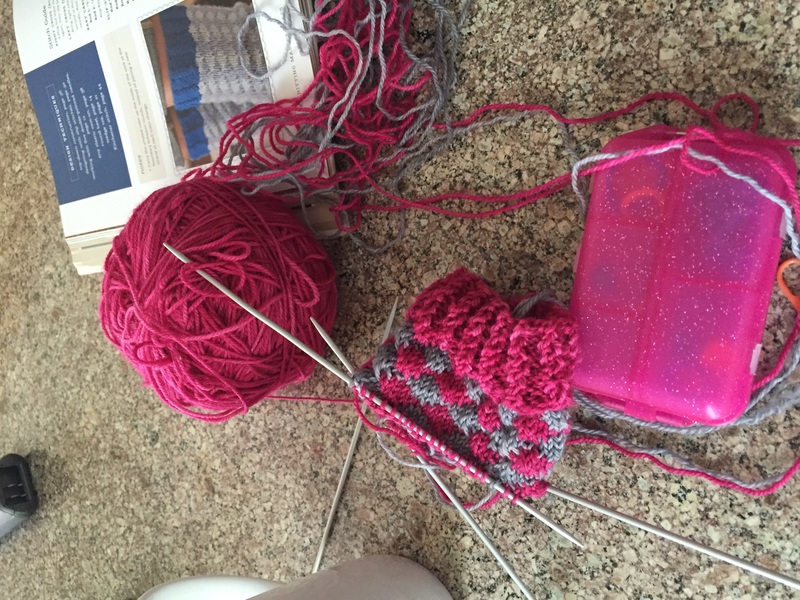 I have a few projects going on right now – socks for J and a short-sleeved summer sweater for me, and I have even more on my agenda. 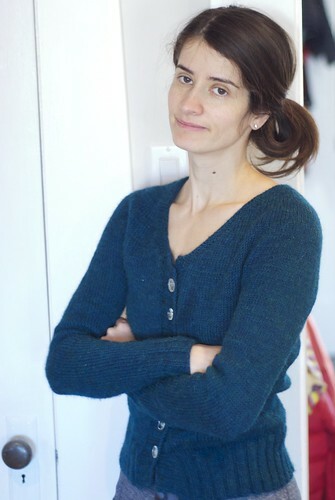 So far I have only finished one item – Joelle Hoverson’s Placket Sweater from her book Last-Minute Knitted Gifts . It took me several weeks, from about mid-April until the start of June to finish it, but I find things are going much more quickly now. 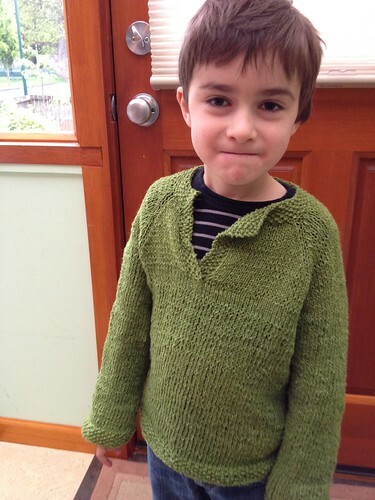 It was a bit of a challenging sweater to start with and I relied on many youtube videos… Only one major issue cropped up, which was that the underarms were a wee bit holy even after I joined them as per the pattern, so I sewed them up with some yarn. But at least that part of the sweater is not visible. If I were to do it again, I’d just pick up an extra stitch at each end and the join to avoid the holes, but I only learned that technique after finishing the sweater. Also, I was definitely doing some weird knitting – I was corrupted by one of those Youtube videos – gotta be careful with that. So the stitches are kind of weird and wonky, and then get corrected about 2/3 of the way up. I’m taking a sock-making class at my local knit store and she showed us that when picking up stitches for the heel. 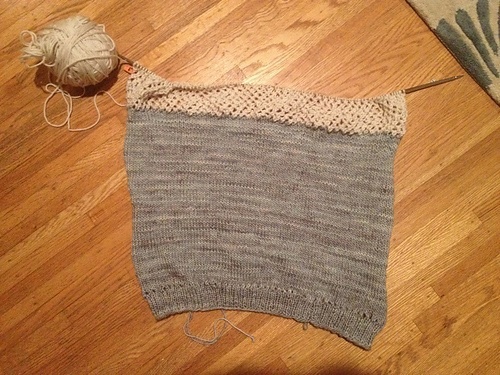 Here’s my next project – the Purl Bee Cap Sleeve Lattice Top, which looks perfect for a Northwest Summer. 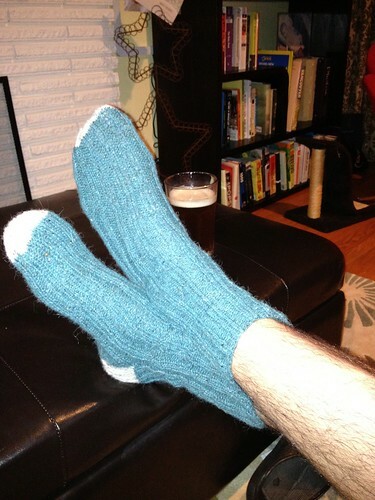 And of course, just in time for Father’s Day, the Churchmouse Basic Sock. Poor J gets pretty neglected in the made-by-me category, so here was something to make-up for it. If any of you are on Ravelry you find me there with username lookingatstars and I’d love to see what you made.